When friends ask me for some make ahead meal ideas, one of my first recommendations are for stuffed or layered pastas such as stuffed shells, lasagna or even manicotti. For one, stuffed and layered pastas allow for a lot of improvisation. You're able to get away with throwing random ingredients together mixed with a cheesy creamy filling, cover with sauce, top with cheese and bake away. These dishes are also great for freezing... and I've found that they make the best leftovers after the flavors have time to really meld. I tend to make quite a few lasagnas and stuffed shells but one pasta dish I haven't really made too often is Manicotti. Perhaps it was the thought of having to boil the pasta tubes in water and then awkwardly filling them with a [makeshift] piping bag. But after reading up on various approaches to Manicotti, I learned it doesn't have to be so awkward. Manicotti can be easy with a couple tricks! One trick is to do what I've done with the recipe below. I used the dry manicotti shells, boiled them and allowed them to cool. Instead of fumbling with trying to fill the shell through the open ends, I just cut them open lengthwise, add the filling down one side and roll it up into a tube. It's a perfectly filled tube every time. Alternately, you could use no-boil lasagna pasta sheets. You'll need to allow the pasta sheets to soak in hot water in order to have them pliable to work with. Once they're pliable and cool enough to work with, add the filling down one side and roll it up into a tube. I prefer using the manicotti tubes since resulted in a perfect pasta/filling ratio whereas using the lasagna pasta sheets tends to result in more pasta than filling. Another alternative is using jumbo pasta shells! But try what works best for you and see what you prefer! Press SAUTE and add oil to IP and crumble the italian sausage and ground beef into the pot. Stir and cook until no longer pink, about 6 minutes. Add the garlic, onions and carrots to the meat and cook until fragrant but not brown, 3-4 minutes. Stir in crushed tomatoes and 1/2 teaspoon salt and simmer until thickened slightly, about 5-7 minutes. Stir in basil and parsley; adjust seasoning with salt. Transfer sauce to a large bowl and clean out IP insert. Return insert to IP. Press KEEP WARM/OFF and place the IP trivet in the now clean, empty IP pot and add 1 1/2 cups of water. For the spinach & cheese filling: Combine spinach, ricotta, 1 cup Parmesan, mozzarella, eggs, salt, pepper, and herbs in medium bowl; set aside. Lightly grease a 7" or 6" springform pan with cooking spray. Spread 1/2 cup of pasta sauce on the bottom of the springform pan. Take the cooled manicotti shells and carefully cut a slit across each one to open up. 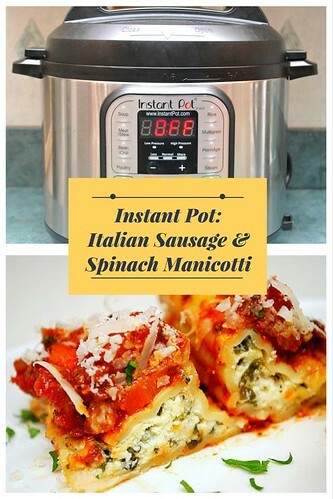 Place 1-2 tablespoons of spinach and cheese mixture evenly down one side of each open manicotti shell and roll into a tube shape to enclose. Place seam side down in the prepared springform pan. Pour the remaining tomato sauce over the rolls in the springform pan and sprinkle top with remaining 3/4 cup grated cheese. Cover with plastic wrap and top with foil. Carefully place springform pan on the trivet set in the IP. Remove springform pan from IP and uncover. Place springform pan on baking sheet and sprinkle manicotti evenly with remaining 1 cup Parmesan. Allow to stand for 15 minutes, then serve. Additional freshly grated Parmesan can be added to garnish if desired.